When the situation is out of control and pain unbearable we cannot do anything other than looking at Our Sai and surrendering to Him all our worries but our mind is so fickle that it bounces back and starts worrying. When such a situation arises where we have nothing in our hand and no thoughts to think or plan only our hope is our Sai than ,our Sai play His leela. Sai devotee who does not wish to give her name is undergoing hard phase of her life but holding on to Baba with full faith that one day her life shall be happy .During her painful moments she was blessed by Baba to sing the song /peom please read below the following mail which she wishes to share with all .Jai Sai Ram . I would like to tell you about how Our SaiNath blessed me with a song or poem. I keep reading the blog almost daily and I do this for my selfishness- to get peace of mind. I'm going through a very tough time Manishaji. 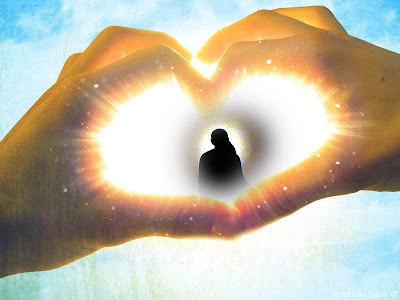 My only hope and light is My Father Sai and everything, Sai Baba. Yesterday night i.e 14th Feb '09 night, I didn't get sleep and was crying very much hating myself and scolding myself a lot.As I mentioned, I cannot disclose the reasons for my sorrow.I'm very dipressed even at this moment.I tried to sleep and all of a sudden I started thinking of Baba and how much he suffered(inspite of being God Incarnation) just for us, just to make us realize the Truth. Then, I started singing the below song without my knowledge. Only, baba could get those words from me, because, I'm very ignorant girl.I immediately took out my diary and wrote this down for the fear I may forget it again. It is in Telugu. I know Hindi a bit, so tried to translate this in Hindi. Again, this too is Sai Kripa. Please feel free to correct, if there are many mistakes. Download the song/peom in devotees voice to hear from this link here. I recorded the Hindi version of the song and attached it. It may be very simple but just out of joy- how much it meant for me, I recorded it... Now, Manishaji, what can I say? It is so much for me.....I don't know what to do. I really could not imagine a poem from my mouth... Never imagined it even in my dream that Sai will do this for me. I remember only one thing. My mind was completely blank that time... It happens sometimes when you are in deep trouble and put every thing at Sai Feet. Again, I doubt myself if I really do that? May be for a moment I tell Baba, you take care. Yet, I keep worrying about it the very next moment. Many times I feel, let the sorrows and pain be with me, but Baba, please don't leave me. Our mind is a mad monkey. It always wants something. It just cannot keep quiet and how many ways Sai assures us to be cool. Hope I will follow atleast one of His teachings.